I am sure many of you have come across a “drive slower, save gas mileage” kind of article. This is not one of those. If any of you have read any of my previous articles one may find a common theme among them. I am much more interested in the thought process behind my and other people’s decisions. This article is about the mental connection between being aggressive on the road and being aggressive with the wallet. Aggressive driving usually consists of someone acting carelessly in order to save time and get somewhere a little faster. I am sure most of you have seen people on the freeway weaving in and out of traffic, without so much as a blinker, in order to get by those slow moving vehicles. In traffic the aggressive driver is constantly changing lanes in hopes the other lanes of traffic are moving faster than the one currently occupied. On the streets, these people creep up continuously towards the intersection at a red light in the hopes that they are ready to get moving again as soon as the light changes to green. In my experience riding with drivers like this, they are usually running late because of a bad decision earlier in the day, which by the way of a chain reaction has cause them to need to go faster than anyone else on the road so they can arrive at their destination on time. The place they are usually going is someplace they do not want to be but will be reprimanded if late such as work, school or some appointment they made but obviously cannot keep. After more time is spent driving this way, a habit develops and even if there is no where to go, the aggressive driver will stay the course and continue to cruise through stale yellows, roll through stop signs and occasionally get a ticket that they “totally did not deserve”. All it takes to change this is a little planning ahead and change of attitude. However, when constantly running late and thinking only of the next task, thinking about things such as changing behavioral habits is not in the time budget. The aggressive spender is in a very similar situation but on the highway of finance. The aggressive spender weaves a paycheck in and out of bills, hoping that one that was not expected does not crop up abruptly in the road and cause an accident such as an overdraft. Trying to get ahead the aggressive spender will fall for every get rich quick scheme and fast money making opportunity without thinking far enough ahead to create a backup plan, or a plan at all to follow through with. If eventually the aggressive spender is able to save a little bit, possibly by putting away a portion of a tax return, and tries to invest those savings into stocks or another volatile market, the cool head that is required to stay with it and ride out the storms is not present and the aggressive spender will rush in at a high and sell low leaving the scene with a loss like many we have seen on Wall Street as of late. Constantly trying to keep up with everything in the moment instead of planning ahead and being ready for the sort of twists and turns thrown our way on the highway of finance, the aggressive spender speeds on. The habit of this type of spending develops and the aggressive spender has to get credit cards, loans and extensions to keep up with the pace. Like the aggressive driver, if there was time enough to take a step back and look at the speed the aggressive spender is traveling, the hole that he or she is digging, the proper planning could be made to break these habits. The constant stress of wondering if the check just signed will bounce, if the bills due today will clear and if the missed payment on the credit card will hike the interest rate, will be a thing of the past. 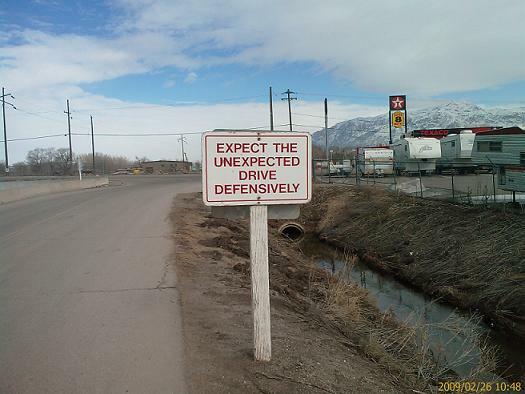 During driver training, the instructor pressed upon us the importance of driving defensively. This means to; scan the road ahead, know your vehicle and it’s instrument panel, be aware of the current road conditions, and always expect the unexpected. In finance this means; create a budget, but even further, know that budget and follow it. Be aware of the current market conditions, or at least the conditions of the bank that your money currently occupies. Have an emergency fund in the plan. And always, always expect the unexpected. This concept is not a mind trick or knowing the future. It means preparing for anything the road can throw at you. Be prepared for that quickly changing yellow. Pay attention to the road signs and adjust speed and route accordingly. Watch out for that pedestrian with iPod in hand about to walk into the intersection. No one can know what will happen out there. The highway, financial and otherwise, is extremely dangerous and things happen that cause your plans to change, so be prepared for those things. Have a plan. Have a backup or emergency plan in case the original plan is altered by unforeseen forces. Drive defensively.